The race is on to build up wetlands barriers in one of North America’s largest estuaries. Erica Gies is an independent journalist based in Victoria in Canada, and San Francisco. There’s something apocalyptic about this pond on the east side of San Francisco Bay, California. The legacy of a salt industry that has moved elsewhere, it has subsided a couple of metres below the level of neighbouring marshland. Algae paints red swirls in the brown water, and the pond’s edge is crusted hard with sparkling salt. As a breeze eases off the bay, a squadron of pelicans sails by, en route to more-appetizing hunting grounds. But there is a better future ahead for landscapes like this one in the Eden Landing Ecological Reserve and elsewhere around the bay. Over the next decade, government officials plan to fill many such depressions with sediment and then open them up to the tides. Eventually, cordgrass, pickleweed and other marsh vegetation will take root, restoring this crucial marsh ecosystem. The goal is to try to create a natural buffer to protect the heavily populated waterfront, by sapping energy from storm surges and blocking the highest tides. 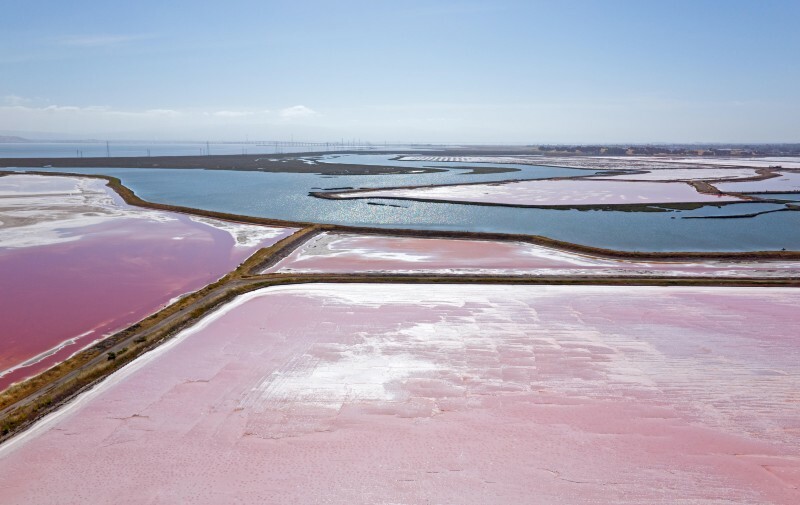 San Francisco Bay’s salt ponds are part of a much broader story. After a century of human development destroyed most of the area’s wetlands, the region did an about-face in the 1970s. It became a leader in marsh restoration, moving into high gear after a groundbreaking plan published in 1998. In recent years, local leaders have tackled these efforts with a new-found sense of urgency. Sea levels here could rise by as much as 2.1 metres by 2100, the California Natural Resources Agency estimates, and that would threaten electricity plants, transportation infrastructure and drinking-water facilities in the region — many of which lie low and close to the bay. San Francisco Bay is not the only region where ecosystems are being enlisted in the fight against climate change. Around the world, researchers and governments are looking to natural coastal infrastructure, including dunes, gravel beaches and mangroves, to protect communities from flooding. 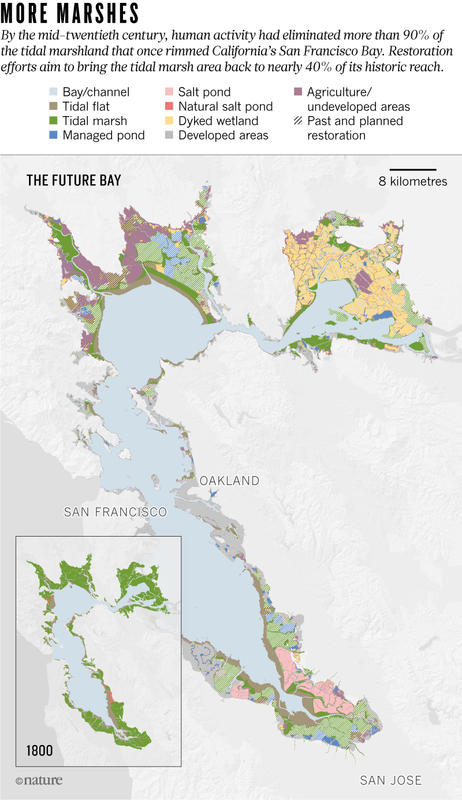 San Francisco Bay’s efforts are among the oldest, having already restored to the tides about 8,000 hectares of habitat. Techniques developed by local scientists have been adopted by US agencies and applied elsewhere in the world, says Peter Goodwin, president of the University of Maryland Center for Environmental Science in Cambridge, Maryland. But the Bay Area faces challenges in constructing a protective phalanx of marshes. Aside from the cost and the outdated regulations that slow work, one of the biggest hurdles is finding enough sediment to do the job. Human development has trapped sediment behind dams and levees, leaving the bay, like many deltas around the world, without enough raw material to keep up with rising seas. Researchers will need to locate large quantities of sediment to fill in sunken former marshes and jump-start the restoration process. And they expect that they will also need to deliver sediment to existing marshes as sea levels rise. Other researchers are watching to see how the Bay Area’s experiments — and its close partnerships among government agencies, scientists and others — pan out. Every coast may be unique, says Eugene Turner, a professor of oceanography and coastal sciences at Louisiana State University in Baton Rouge, but they all face common issues, such as rising seas, changing temperatures and “inappropriate development along the ocean’s edge”, so projects can learn from each other. On a summer day on the northern edge of San Francisco Bay, a marsh harrier glides above a low-lying expanse of tawny yellow and variegated green vegetation, cut with curvaceous channels. Such sights were not as common decades ago. By the 1950s, all but 8% of the bay’s 77,000 hectares of marshes had been dyked off or filled for human uses such as agriculture, rubbish dumps, sewage-treatment plants, navy bases, airports and salt ponds. Growing public awareness of that devastation turned to outrage in the 1960s. In response, local scientists began some of the world’s first marsh restoration projects. Since then, hundreds of researchers, policymakers and regulators have worked together to set and meet ambitious goals. As of 2015, marshlands and mudflats that are in the process of becoming marshes occupied about 29% of the historic marsh area. And local groups have purchased another 10% or so — about 7,300 hectares — and slated it for restoration (see ‘More marshes’). In the beginning, restorers were motivated by a desire to recreate habitats for endangered species, prevent flooding and provide recreation areas. But in the past two years, protecting the region from sea-level rise has become an explicit objective. In a 2016 report (see go.nature.com/2djjojb), locals set a new goal to restore as much marsh acreage as possible by 2030, in the hope that the marshland will be high enough and strong enough to keep up with the expected acceleration in sea-level rise by the middle of the century. Turning to natural systems for such protection is a radical shift from the concrete engineering that dominated the last century. But as human populations expand and climate impacts intensify, the costs and limitations of the artificial approach are becoming more apparent. Sea walls, for example, are brittle; they break rather than flex and have unwanted effects on surrounding areas by, for instance, diverting wave energy to unprotected locations. Coastal ecosystems not only protect inland areas but also provide habitat for endangered species, fish nurseries and natural water-cleaning services. In addition, they can help to combat climate change by storing carbon as they grow. The United States is conducting some of the world’s largest wetlands restoration efforts. To staunch its dramatic land loss, for example, Louisiana is planning multiple diversions to siphon sediment from the Mississippi River to replenish wetlands. The states that surround the Chesapeake Bay on the US east coast aim to restore more than 40,000 hectares of wetlands — although the primary motivation is to reduce pollution from agriculture and urban runoff. In Europe, most tidal-marsh restoration projects, like an effort to build a marsh near the Dutch port of Delfzijl, are much smaller in scale. 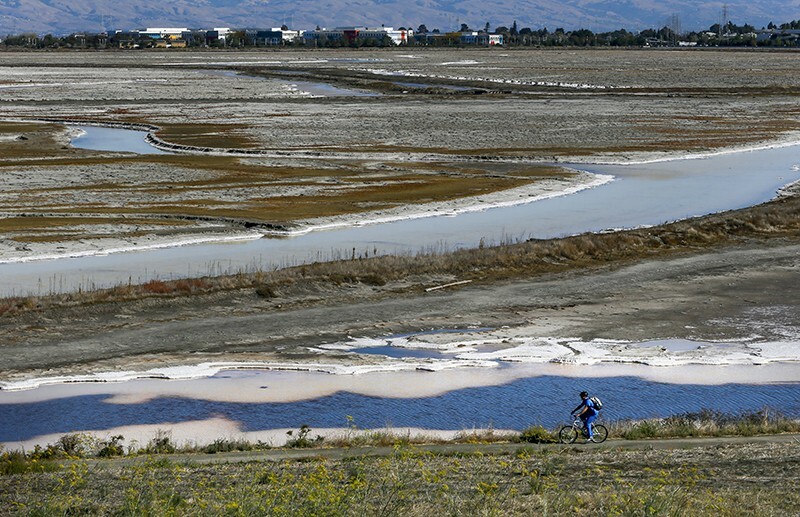 Other regions, such as Long Island in New York, and southern California, as well as countries including England, Singapore and China, regularly enquire about the Bay Area’s projects and methods, says Letitia Grenier, director of the resilient landscapes programme at the San Francisco Estuary Institute (SFEI), an independent aquatic- and ecosystem-science institute based in Richmond, California. “The science here is very proactive and very progressive in the sense of using natural processes as the solution,” she says. Researchers outside the Bay Area note that a key strength is its process. “It’s probably one of the best examples in the country of how universities, agencies and NGOs are working together — and the private sector more recently,” says Goodwin. But despite widespread regional support for wetlands restoration, big obstacles remain to building enough marshland to protect against sea-level rise. 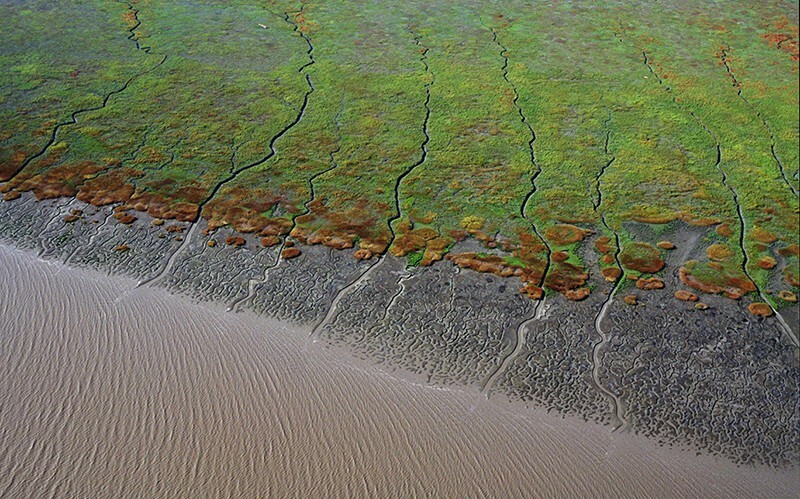 Recreating tidal marshes requires three ingredients: time, space and sediment. Bourgeois says it can take between 5 and 20 years before a salt pond fills with enough sediment for a marsh to take root. Space is also at a premium. Marshes grow upwards in part by marching slowly inland. Unfortunately, says Grenier, “what we have in the back of our marshes is freeways and sewage-treatment plants, and Oracle and Google”. What’s more, there’s a major sediment deficit. Salt ponds such as those at Eden Landing have subsided so far below the level of surrounding marshland that, in order to speed up their recovery, restorers will need to fill them with extra sediment from elsewhere before opening them to the tide. Researchers think that it will also be necessary to feed existing marshes to help them keep pace with rising sea levels. Scott Dusterhoff, the SFEI’s lead geomorphologist, estimates that existing marshes, along with the oyster-bearing mudflats between them and the bay, will face a deficit of roughly 100 million metric tonnes of sediment by 2100 if sea levels rise by 1 metre, a middle-of-the-road scenario. If current trends continue, scientists fear that most of the bay’s marshes will be damaged or destroyed by 2100. One large potential source lies in San Francisco Bay’s deepwater ports, which require routine dredging to remove sediment piled up by the tides. Much of that dredged material is carried offshore and deposited in the ocean, says Brenda Goeden, sediment programme manager for the San Francisco Bay Conservation and Development Commission, a state planning and regulatory agency. The practice was begun to protect the bay from dumped sediment, which can harm wildlife if it is contaminated or clouds the water. Eventually, in the 1990s, regulatory agencies recognized the need for sediment in marsh restoration and began issuing permits for the ‘beneficial use’ of dredged material that was proved to be clean. But last year, about half was still deposited in the ocean, says Goeden. Dirt could also come from the region’s construction boom. SediMatch, a project by the non-governmental organization San Francisco Bay Joint Venture and the SFEI, is putting “folks with sediment together with people doing bay restoration who need sediment”, says Grenier. “It’s a dating service for sediment.” But the pace of moving material can be slow. The salt ponds at Eden Landing, for example, require an estimated 5.4 million cubic metres of sediment to bring them close to the level of surrounding marshland. A truck delivers about 8.4 cubic metres at a time. “Do the math,” says Bourgeois. “That’s a lot of trucks.” He is proposing an alternative: a barge in the middle of the bay where dredged sediment could be mixed with water to create slurry, which could then be delivered by pipe to Eden Landing and other restoration projects. But questions remain about how best to deliver scavenged sediment, both to lift defunct marshes quickly and, in the future, to help existing marshes to keep pace with sea-level rise. There is a range of possible tactics. In Louisiana, for example, a project called Bayou Dupont is dredging Mississippi River mud and moving it through a kilometres-long pipeline to build wetlands. The marshes there have been so severely starved of sediment — and affected by subsidence, erosion, and oil and gas development — that they are drowning rapidly. So the project sprays dredged sediment mixed with water directly down onto the sinking marsh to raise its elevation quickly, as Bourgeois is proposing for some of the South Bay sites that are not yet active marshes. But raining slurry “fills in all the holes and channels simultaneously, so it tends to flatten out the topography”, says Jeremy Lowe, a senior environmental scientist at the SFEI. Marsh plants and animals prefer more variability, and varied topography is better for slowing down floodwaters, too. For these reasons, restoration ecologists in the Bay Area typically stop filling about 30 centimetres below the marsh plain level, then open the area to tidal and possibly river flows, allowing natural systems to finish the job. The US Army Corps of Engineers and the SFEI want to test the use of waves and tides to move supplemental sediment into place, not only to avoid the uniformity problems created by slurrying, but also to avoid its cost and energy footprint. This approach could become necessary if future marshes need supplemental sediment to keep up with sea-level rise; the material will need to be delivered more delicately to a functioning wetland than to a salt-pond hole. The Bay Area is angling to take a “kinder, gentler, more natural-process approach”, says Grenier, that will allow “plant and animal populations to thrive”. As part of that as-yet-unfunded effort, the groups also hope to study how much deployed sediment actually lands on marshes targeted for restoration, which would help scientists to understand how much sediment is needed and how long restoration will take. Lowe is proposing to use fluorescent tracers to track where particles go in the bay. Another experiment with a soft approach to sediment deposition is under way in the Netherlands. The pilot project takes sediment dredged from the port at Harlingen on the Wadden Sea, and releases it farther along the coast, where researchers hope it will help to shore up a tidal marsh at Koehoal. That money won’t be enough to do the job, but local advocates are hoping that they can leverage it to get federal funding. The clock is ticking for the restoration community to meet its 2030 goal. If it can find sediment to fill subsided areas, marshes could begin to establish themselves in 1–5 years, depending on the starting elevation and other variables, says Bourgeois. The agencies responsible for dredging regulations recognize the threat of sea-level rise and are currently re-evaluating their policies, but regulatory hurdles remain. “A lot of what we’re proposing presents a real struggle to get permits because all of the laws were focused on preventing people from filling the bay,” says Bourgeois. He and other restorers say permits aren’t being issued fast enough to meet their 2030 restoration goal. In the end, all of this is one big experiment. “Restoring marshes is still somewhat new to society, and so there will be surprises, mistakes and unexpected successes,” says Turner. The Bay Area’s effort is doing many positive things, he says: storing carbon underground, recreating wildlife habitat and investing in natural infrastructure, which is much cheaper than emergency relief after disasters. Yet, he adds, “It is unclear if any coastal restoration programme will be enough to resist sea-level rise”.